Forget the Country Time -- get this instead! Icy fizzy fruity lemonade. It’s tropical and refreshing at the same time. Glas Basix Fizzy Lemonade is another hit! I absolutely love the branding on the Basix line-up. Glas managed to keep everything clean and professional, while still making the packaging and bottles look presentable; this proves that cartoon character graphics, catchy titling, and absurd vape juice names are not necessary to increase the value of a vape product. The gorilla bottles are a nice addition to the Basix line as well. Normally I test liquids in 0mg. I accidentally grabbed fizzy lemonade in 3mg (hey, we all make mistakes sometimes!). So take this review with a grain of salt. It’s citrus-y, it’s fizzy and it’s icy cold menthol! Delight in this sweet and refreshing sparkling lemonade poured over lemon-lime shaved ice with a cool, carbonated twist. Freshly squeezed lemonade with a hint of acidity on the back end. There’s also a little lemon zest perfume thrown in the mix for good measure. Based off smell alone, I was anticipating a very refreshing vape, great for the summertime! Single 3mm clapton on the deck of the OG Goon. Pulsed on the Lavabox DNA 200 by Volcano E-Cigs. Kept the wattage relatively low for this review (40-50), and the airflow on goon shutdown 50%. Front – There’s a pretty intense icy note right up front; it’s on the border of minty and menthol. The full lemonade flavors is somewhat hidden in the background; fruity flavors are attempting to make their way through. I can already tell this is going to be a mouthwatering vape. Middle – The intense icy note dies down a bit, giving way to more of the lemony flavors. I picked up on another citrus fruit here as well, orange or clementine perhaps. I wouldn’t go quite as far as to say the mixed fruit addition was tropical, but it definitely does a good job at providing a subtle sweetness to the vape. The chalkiness one would associate with homemade lemonade hasn’t been established yet, but it’s very close. I did take note of a fizzy like mouthfeel at this point as well. 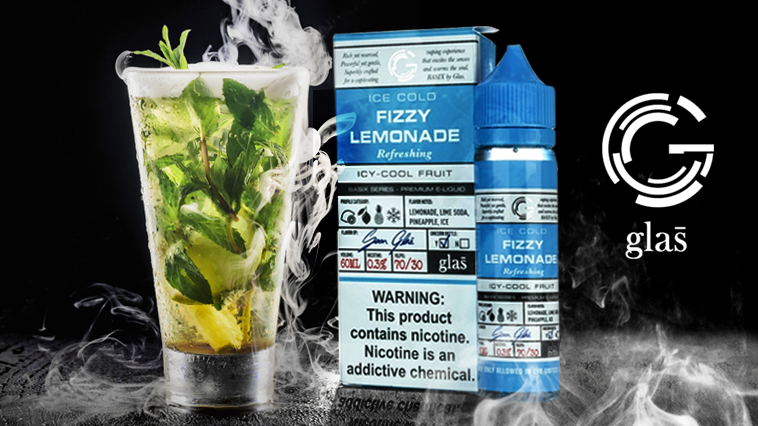 End – Finally, the end of this vape really brings the ‘lemonade’ into full effect. It’s has tropical undertones, and a nice aroma from the lemon zest, and a smooth fizzy mouthfeel to wrap things up. There’s practically no added sugar to note, which makes for a nice smooth vape. Aftertaste – With all the zesty, citrus fruit flavors working in Fizzy Lemonade, I expected the aftertaste to be a bit harsh; especially considering my 3mg test bottle. But to my surprise, and largely due to the fact that the sugar content was so low, my palate was left clean as a whistle after vaping for more than an hour straight. The Glas Basix line is all 70/30, so you’re probably not going to enter a cloud competition with it any time soon. Rocking a single coil setup on top of the thin blend definitely didn’t help boost the vapor production either. Flavor was on point though, and that’s all that matters! Fizzy Lemonade from Glas is a pretty unique flavor. It’s not very often you see a straight lemonade vape, and I’m not really sure why to be honest. Maybe it’s just not appealing as some of the other more complex flavors. Whatever the case may be, this vape had enough going on to keep my interested. I’d definitely give this one my ADV stamp of approval, and would most certainly recommend it to a friend.